Butech Bliss is a leading innovator providing equipment solutions, making our customers more productive and efficient. Our team of highly skilled engineers has more than 30 years of experience designing and manufacturing equipment solutions for the steel industry. From the earliest days of our company to the present, our equipment has been renowned for its reliability and toughness. Butech Bliss begins the process with a discussion of your wants and needs. We listen to your requirements, investigate material flow and building restrictions. As part of our solution, Butech Bliss provides line arrangements, placing the line into your building to accommodate material flow. As the project develops, our skilled engineering team works closely with our manufacturing center to ensure that all equipment is thoroughly tested to meet our stringent quality standards. Our engineering services range from budgetary engineering studies to complete turnkey installation along with hands on equipment training. They were the only company that could do what we wanted and build for us the equipment no one else has, so we could go after new markets.!!! 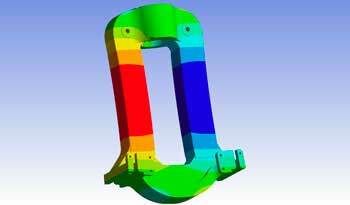 Butech Bliss engineers are well versed in Finite Element Analysis; a powerful tool used for solving complex stress situations. This assures that our team brings a complete engineered solution to our customers. 3D solid modeling is yet another tool being used by our engineering team. This progressive technology permits our engineers to create three dimensional virtual models and apply simulated motion to predict real world performance. As a family-owned business, we are dedicated to maintaining our legacy of excellent customer service. Butech Bliss has a dedicated team of experienced field service engineers to perform new and retrofit equipment installations, maintenance as well as complete turnkey equipment installations. With our 24 hour a day field service hotline, you can be rest assured that your service request will be addressed promptly by our knowledgeable field service engineers. Our experience with service from Butech over the years has been nothing short of excellent. When accuracy is critical Butech Bliss has you covered with the most accurate measurement system in the industry. Introducing the FARO Vantage laser tracker a portable, non-contact Coordinate Measuring Machine (CMM) capable of performing high accuracy, large volume measurements. With this system, we can offer our customers the most accurate measurements on equipment installations and repairs. Whether you are upgrading or installing coil processing equipment, performing an extrusion press alignment or assessments, mill equipment inspections, frame installations and platform inspections our FARO measuring services are essential to an accurate install. The laser system also produces detailed reports which is an invaluable tool for quality control and engineering services. Produces detailed reports which is an invaluable tool for quality control and engineering services. The Electrical and Automation Group, with its team of accomplished engineers, is capable of supplying the control systems for the complete range of Butech Bliss products. The equipment supplied includes low voltage power distribution, drive systems, controllers and Level 2 systems. Typical applications include coil processing lines, shears, scrap choppers, multi-drive hydraulic levelers, stretchers and rolling mill control. Equipment supplied includes MCCs, variable speed motors and drives, PLC controls, motion controls, operator stations with HMIs and Level 2 systems. Both remote and on-site support is available from the same design engineers. The Butech Bliss automation group utilizes a Virtual Private Network (VPN) to monitor your equipments performance and in many cases provides programming assistance and troubleshooting when required from our offices. The VPN significantly reduces your service costs and eliminates delays waiting for a service engineer to arrive at your site. Click here to learn about our HAGC Service Program. What can we do for you to day? We have complete line of equipment spare parts and equipment rebuild service.